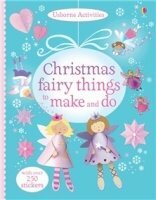 An enchanting collection of activities to keep all fairy-loving children entertained in the run-up to Christmas and beyond. The projects include making sparkly crowns and wands, glittery star chains, fairy Christmas tree decorations and a fairy castle advent calendar. Each activity is carefully explained with easy-to-follow instructions, and illustrations of each step. With over 250 stickers to add to the creations.